DU Admission 2019 - The University of Delhi has announced to commence DU 2019 admission from May 1, 2019. The expected schedule of DU application form date will be released by the university officials soon. Candidates who are willing to enrol into any undergraduate programmes like B.A, B.Com and B.Sc programmes offered by the colleges affiliated to the University of Delhi must fill and submit the online application form of DU admission 2019. The application forms of Delhi University 2019 admission will be available from May 1, 2019. The last date to submit the DU admission form 2019 will be notified by the university officials. DU admission 2019 will be conducted through both merit and entrance exam. The merit list of Delhi University admission 2019 will be made through the 'Best of four' calculation of the University of Delhi. The colleges affiliated to the University of Delhi will release close to 11 cutoffs for admission in DU 2019. The University of Delhi offers about 56,000 seats in the 82 colleges affiliated to the University among which few colleges are autonomous. Candidates participating in DU 2019 admission can apply for both merit-based and entrance based programmes on a single application form itself. The detailed procedure of Delhi University 2019 admission is given below in the article. Increase in Registration Fee- The university will, most probably, be increasing the registration fee for the candidates who want to apply for DU 2019 admission. The application fee will be increased from Rs. 150 to 200 for the general category. However, the candidates belonging to SC/ST category will have to pay Rs. 150. Correction Window- Delhi University will be introducing the DU application form 2019 correction window, in a first. However, the university has decided that it will be charging Rs. 100 for every change made. Increase in Cancellation Fee- The university will be increasing the admission cancellation fee by 100% to Rs. 1000. Online Marks Calculator- The official website will have an 'Online Marks Calculator' launched by the officials to help the candidates calculate their 'Best of Four' aggregate marks. Live Display on the Website- The university will be having a 24*7 live display of the cutoffs and the vacant seats on the dashboard of the students' online portal. Limited choice- The candidates will get up to 3 sub-categories to choose under ECA and Sports category to make the process of auditioning the candidates hassle-free. Reservation for EWS- The university has decided to reserve at least 10% seats for EWS (Economically Weaker Section). Stream Change- During the process of stream changing, the university used to deduct as much as 5% of the 'Best of four' aggregate marks, which has now decreased to only 2%. Delhi University 2019 admission for UG Programmes is conducted mostly through merit formed by the calculation of 'Best of Four'. The university will begin the DU admission procedure with the release of the online application form of DU admission UG 2019. The information related to the DU admission form date will be announced by the university soon. In the application form of Delhi University admission 2019, candidates need to enter the marks secured by them in the 'Best four' subjects. After the application form window is closed, candidates will be notified about the release of DU admission 2019 cutoff. The candidates who qualify the cutoff rank mentioned in each list must attend the document verification process of Delhi University admission 2019 which will be conducted in the different colleges. Candidates must note that the cutoff of Delhi University admission will be released based on the number of seats vacant in each of the colleges for the individual programmes. Candidates applying for undergraduates programmes like B.A, B.Com and B.Sc programmes offered by the University of Delhi must make sure to fulfil DU eligibility criteria 2019. One of the most salient criteria of the Delhi University admission procedure is to pass the DU 2019 eligibility criteria. The eligibility criteria of DU 2019 consists of minimum marks/degree that a candidate is expected to acquire/possess to be eligible enough for Delhi University admission procedure. Any candidate who does not fulfil the eligibility criteria is not considered eligible for DU admission 2019. As per the University of Delhi, Candidates applying for DU 2019 admission must have completed their class 12 examination from CBSE or any other recognized state board. Candidates applying in the minority institutions can also apply online for DU admission 2019. Except for St. Stephen's and Jesus and Mary Colleges, the eligibility criteria of Delhi University UG admission 2019 stand common for all the other colleges affiliated to the University. There is no minimum age bar mentioned for applicants of DU admission 2019. Candidates belonging to the reserved categories must check the special eligibility prescribed for the same before applying for Delhi University admission 2019. Best of Four is the aggregate of the best four subjects from the qualifying examination of the candidate. The following subjects will be included in the 'Best of four' calculation of Delhi University admission. Candidates must note that the subjects of DU admission 2019 will differ based on the programme they wish to apply for although the language subject will remain constant. The very first step of DU admission process is to fill the application form for the courses they are desirable of. The application form of Delhi University admission 2019 will be available from May 01, 2019. The DU admission form last date will be notified. The exact schedule for the DU admission form date will be communicated by the university officials soon. To fill the DU 2019 application form, the candidates will have to get the access of Delhi University admission portal by getting themselves registered online. Candidates applying for undergraduate programmes must first complete the online registration process on the admission portal of the University of Delhi. After the registration is complete candidates can log in and complete the DU application form 2019. To login, candidates need to enter the username and password they created during the registration process. While filling the application form of Delhi University admission 2019 along with the personal details candidates are also required to enter the marks secured by them in 'Best of Four' subjects of their qualifying examination. Candidates can apply for multiple programmes through a single DU admission form 2019 admission. Candidates belonging to the reserved categories must upload the relevant documents supporting their claim to the reservation without which they will not be considered for DU admission 2019 under the said category. The application fee to be submitted for each category is given here. After the candidates are done registering themselves for Delhi University admission portal and filling the application form, they can continue to remit the Delhi University admission fees online through debit cards/credit cards/netbanking. The admission fee of DU 2019 admission will vary for different categories. The table given below will give you an insight on DU admission fee. The University of Delhi offers various undergraduate programmes in the affiliated colleges. Given below is the list of programmes under each faculty for both merit and entrance based admissions. Candidates applying for undergraduate and postgraduate programmes of Delhi University must check DU courses 2019 before filling the application form. B.A. Programme, B.A. (Hons.) in Arabic, Bengali, English, French, German, Italian, Hindi, Persian, Philosophy, Psychology, Applied Psychology, Punjabi, Sanskrit, Spanish, and Urdu. B.A. (Hons.) in Economics, Geography, History, Political Sciences, Social Work, and Sociology. Bachelor of Science [Hons.] in Anthropology, Biochemistry, Biomedical Science, Biological Sciences, Botany, Chemistry, Electronics, Food Technology, Geology, Home Science, Instrumentation, Microbiology, Physics, Polymer Sciences, Zoology. Delhi University admission is conducted for the 82 colleges affiliated to the university. Candidates can check DU colleges 2019 to know the list of all colleges offering seats through Delhi University admission 2019. The colleges of Delhi University are divided as per the different campuses such as North Campus, West Campus, South Campus, Dhaula Kuan Campus, East Campus and Central Campus. The Formula to calculate the grade point average awarded in Cambridge School Certificate/ Malayalam / Overseas /African G.C.E./ Examination School Certificate Examination and / or 12th Grade Examination of American Embassy School, New Delhi along with the percentage of marks as are awarded in the Higher Secondary Examination of the Central Board of Secondary Education, New Delhi, for the purpose of admission to different Programmes in the University of Delhi is given below. Candidates can check here the grade points as per the board of their qualifying examination. The colleges affiliated to Delhi University will release the DU 2019 cutoff for the different programmes which will be notified by the officials. The cutoff of Delhi University admission 2019 is the minimum marks at which candidates will be considered qualified for the document verification process. Candidates who qualify the cutoff rank of DU admission 2019 need to attend the document verification process which will be held in the respective colleges along with all the relevant documents and certificates. After the document verification is complete candidates can submit the admission fee online and secure their admission for the offered programmes of Delhi University admission 2019. Two passport size self-attested photographs. Candidates belonging to the reservation categories mentioned can apply for the same in the application form of Delhi University 2019 admission along with relevant documents to support the claim. Candidates who do not have rightful documents and do not fit the eligibility prescribed for the category concerned will not be considered for Delhi University admission 2019. The per cent of seats reserved for each of the categories is given here. Q: How can I register myself for the undergraduate programmes in Delhi University 2019 admission? Ans: Candidates can visit the official website of Delhi University and can register themselves online for the undergraduate courses of DU 2019 admission. Candidates can check the eligibility criteria of DU admission 2019 of various undergraduate programmes before filling the application form. Q: Does the University release separate application forms for different colleges? 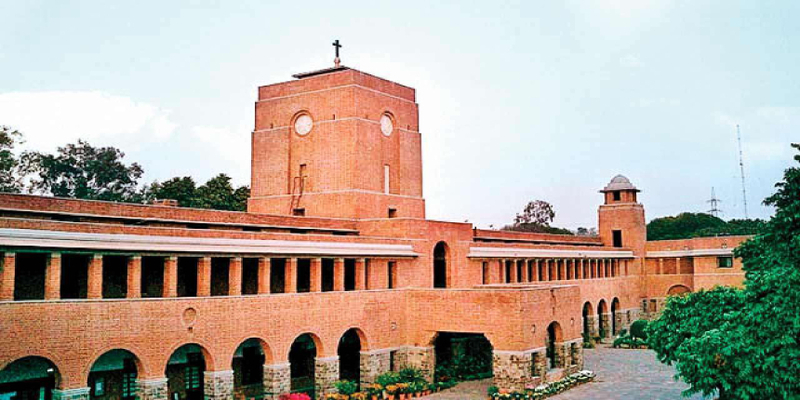 Ans: Except for St. Stephen's College and Jesus and Mary College, all the colleges of Delhi University have a common application form. Q: What is the qualifying examination for the undergraduate programmes of DU 2019 admission? Ans: The qualifying examination to apply for undergraduate programmes of DU admission 2019 is senior secondary examination from any recognized board of education. Q: How many cutoffs are released by Delhi university? Ans: The colleges of the university release close to 11 cutoffs every year for Delhi university admission 2019. The release of cutoff lists depends upon the number of vacant seats available in each category after the document verification for each round is completed. Q: How will Delhi University intake candidates for undergraduate programmes? Ans: Delhi University allows the intake of the candidates with the help of 'Best of Four' calculation for the undergraduate programmes. Though, the university is thinking of including an entrance test in DU admission 2019. Q: Are DU forms out for 2019? Ans: The application forms of DU admission 2019 is likely to release by May 1, 2019, for admissions in undergraduate programmes based on the merit of the last qualifying examination. For postgraduate and some undergraduate DU admission courses where admission is conducted through an entrance test, the university will start the registration process from May 7, 2019. Q: Is there any entrance exam for admission in DU? Ans: Delhi University conducts an entrance examination for DU admission in postgraduates and some undergraduate programmes like B.A Hons. (Multimedia and Mass Communication, Business Economics, Journalism and Mass Communication, Humanities and Social Sciences). Q: What is the procedure of admission in DU? Ans: Delhi University admission takes place through both merit and entrance exam. The merit list of DU Admission is made with the help of ‘Best of Four’ calculation of Delhi University. The university release around 11 cutoffs for DU admission. The entrance test is conducted for DU admission for admission in postgraduate and undergraduate programmes like B.A Hons. (Multimedia and Mass Communication, Business Economics, Journalism and Mass Communication, Humanities and Social Sciences). Q: Is maths compulsory for B.Com Hons in DU? Ans: Yes, candidates who are willing to apply for B.Com Hons. programmes of DU admission must have completed their senior secondary examination with Mathematics/ Business Mathematics as one of the subjects. Q: Is there any entrance exam for B.Sc in DU? Ans: No, the university does not conduct any entrance examination for any B.Sc programmes of Delhi University admission. For admission in B.Sc programmes, the university release merit list based on ‘Best of Four’ calculation of DU admissions. Q: Is maths compulsory for BBA in DU? Ans: Yes, candidates must have studied Mathematics as one of the subjects in their senior secondary examination for appearing in the BBA programme of DU admission. For admissions in BBA programme, the university conducts an entrance examination called DU JAT as a part of Delhi University admission process for selecting students. Q: Is there any entrance exam for Psychology at Delhi University admission? Ans: The admissions in undergraduate programmes of Psychology is done based on the merit formed by the score of the last qualifying examination. For postgraduate programmes, the university conducts an entrance examination for Psychology programmes of DU admission. Q: What are the criteria to get admission in Delhi University? Delhi University holds DU admission 2019 for the candidates to take entrance examination if they are seeking admission in the university. The process includes registration for the course, filling an online application form, release of the cut off lists. The university releases as much as 11 cut off lists, depending on the vacant seats in the colleges and the quantity of the application forms received. The candidates who have the minimum cutoff marks as his/her ‘best of four’ aggregate marks can visit the colleges to complete the admission process by submitting the required documents and paying the semester fee. Q: Does DU offer B. Tech? Ans: Yes, there are colleges providing the courses of B. Tech. The admission to this course is done by the Delhi University Entrance Test (DUET). Q: Can I take admission in SRCC without maths? Ans: The eligibility criteria of DU 2019 states that the candidates must have mathematics as a core subject in their 12th standard to be eligible for DU 2019 admission. Under UG programmes, SRCC offers B. Com (Hons.) and B. A. (Hons.) Economics, both of which need mathematics as a core subject. Q: When will the DU application form 2019 be started? Ans: As per the scheduled notification, the university will start the process of application form of DU admission 2019 from May 1. Q: What is the DU eligibility criteria 2019? Ans: The eligibility criteria of DU 2019 includes the required marks/degree that a candidate needs to possess/have acquired in order to be eligible for the DU admission 2019. Q: What is DU cut off 2019? Ans: The cut off of DU 2019 consists of minimum numbers/marks that a candidate should have in their ‘Best of four’ aggregate marks to be eligible for the admission in a certain college. The university releases as much as 11 cutoffs for the academic year. Q: What are the changes in DU Admission 2019 that were not there in year 2018? Ans: This year, in DU admission 2019, the university will deduct as much as 2% from the ‘best of four’ aggregate marks during the change of streams. There is one more change which can be seen with respect to DU admission 2018 process. The ECA quota will be delinked from the regular cut off list of DU admission 2019. The trail for Sports and ECA Category admission will start from May 20, 2019. Is there any entrance exam to ba hons. Political science in du? Is there any entrance exam for ba hons. Political science in du? bba entrance ,DU ,fees ,placement,other related stuffs.